If you love camping, but don’t enjoy sleeping on the cold, rocky ground, why not give hammock camping a try instead? Hammocks are a lightweight and comfortable alternative to traditional tent camping and over the past few years, we’ve seen serious innovation in terms of improving the hammock camping experience. Why wouldn’t you want to be rocked to sleep while taking in the fresh night air beneath a luminous canvas of scattered stars scattered across the sky overhead? While tents generally require large dry and flat areas to set up, hammock camping can be done just about anywhere you can find two trees. Generally lighter in weight and easier to set up, hammocks have the added advantage of keeping you suspended off the hard ground. For fast and light trips into the backcountry, the most difficult decision you may have to make is deciding which hammock is right for you. To help, here are the best camping hammocks available. The Warbonnet Blackbird is designed to be comfortable, easy to adjust, and versatile. This all-around option for hammock campers is an ideal choice for any terrain or weather condition. The Blackbird comes with tons of added features, too, including a foot box, storage shelf, and bug net. Warbonnet overs the model in both single and double-layer options and is made of DWR-treated 70D nylon for added water resistance. The whole package weighs just over three pounds and includes an asymmetrical design that provides added comfort. While this is an incredibly comfortable hammock, taller campers (read: over 6 feet) may want to consider the Blackbird XLC. This surprisingly lightweight and versatile hammock gives backpackers all the benefits of a tent but with the comfort and weight of a hammock. Its included rainfly and insect netting provide an excellent shelter for the night, even when conditions are less than optimal. The Explorer is a lightweight, all-in-one solution for those making extended expeditions into the backcountry. This model also gets bonus points for being long enough to support campers up to 7 feet in height and 250 pounds in weight, making it a good choice for those who need a bit of extra space. Whether you’re looking for a massive hammock to have all to yourself or you need one to share with a companion, the DoubleNest from ENO is here to help. Weighing in at just 19 ounces, this hammock can comfortably support up to 400 pounds of weight, making it a favorite for use in the backcountry or the backyard. Backpackers will likely want to add the Guardian Bug Net ($60) and the DryFly Rain Tarp ($80) for a complete camping solution. The Kammock Roo Single is the perfect all-around hammock in terms of comfort, adaptability, and weight. It is lightweight (just 10 ounces), easy to carry, and extremely durable. It’s also rated to 400 pounds, is treated with a DWR coating, and is highly breathable, making it a good option for use in warmer climates. It doesn’t come with a rain fly or bug net, though both can be purchased separately. While designed to sleep one person comfortably, the Room Single is perfect for two when lounging. For those who count every ounce out on the trail. 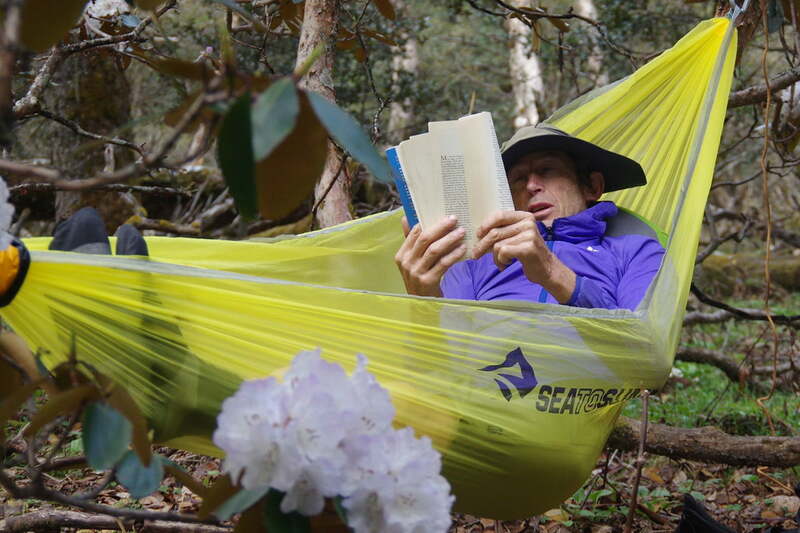 the Sea to Summit Ultralight was designed with a special monofilament that makes it the world’s lightest hammock, while still supporting up to 300 pounds of weight. This product was specifically made for those who want to go light and fast without sacrificing performance. The hammock weighs a mere 5.4 ounces and comes with a compression kit with extra space for suspension straps, however, the latter must be purchased separately. The Sunda Tent Hammock is the next evolution in camping. This shelter is extremely versatile, allowing backpackers and mountaineers to set it up on the ground, or in the air, as the terrain dictates. It’s large enough to comfortably sleep two, with room left over for gear — or even your dog. While not as lightweight as a few other hammocks on this list, it makes up for it by being the total package in terms of backcountry comfort and mobility. As a bonus, a rainfly and ground footprint are included. The hammock you buy determines how well (or poorly) you’ll sleep during your time in the outdoors. Most importantly, you need to decide on the primary purpose of your hammock. Will you be taking primarily overnight trips in good weather or embarking on weeklong expeditions through the backcountry where the weather is unpredictable? Hammocks come in many shapes and sizes, so rest assured that time spent researching which hammock best suits your needs is time well spent. There are three main types of hammocks — parachute nylon hammocks, ultralight hammocks, and expedition hammocks. Parachute nylon hammocks are ideal for everyday camping trips due to the durability of the material and the level of comfort provided by their slight stretch. These types of hammocks are available in both single and double models, depending on whether you want to sleep alone or with a companion. Ultralight hammocks are exactly as the name implies — the lightest options on the market. They are designed to be compact and taken on excursions where speed is of the essence. The thinner fabric found on these types of hammocks often result in less support, which can lead to a slight sacrifice in comfort. Expedition hammocks serve as the complete package, allowing for everything you need to take on a long-distance journey. These products tend to be made with the highest-end materials for guaranteed durability and resistance to the elements. They usually come with accessories, including an insect net, tree straps, extra guy lines, slings, and a rainfly. Hammocks come in different shapes and sizes, which are suited for a wide range of people. Selecting the proper width and length of your hammock can make or break a good night’s sleep. Generally, the wider and longer the hammock, the more comfortable it will be, but the larger the size of the hammock, the more it’s going to weigh too. For tall people, hammocks at least 8 feet in length are recommended. Maximum weight capacity recommendations should also always be followed. There are extra-large models on the market for heavier people, along with double styles for those who want to sleep in pairs. That said, overloading a hammock is both detrimental to the lifespan of the product and dangerous. It will probably cause the level of comfort to drop as well. If you’re opting to leave your tent behind, your hammock must serve as both your shelter from the elements and a comfortable place to lay your head. Even in summer, nights can be cold, especially during inclement weather or unexpected conditions. The insulation you choose will play a significant role in how comfortable you are when temperatures drop. Your options include adding a foam or inflatable sleeping pad to your set up, purchasing a double-layered hammock, or utilizing an underquilt. These items can work in conjunction with a sleeping bag to keep you cozy even when the weather takes a turn for the worse. If you already own a sleeping pad, you can try to situate it in your hammock to use on a cold night or for added comfort. The downside to this is most pads tend to move out from under you due to the hammock’s nesting shape as opposed to the flat ground they were designed for. We recommend experimenting at home before heading out on your expedition and if you find your pad isn’t up to snuff, you may consider purchasing one that is specifically built for use with hammocks. Gear manufacturer Klymit offers some good options. Double-layered hammocks have the advantage of an added compartment utilized for holding your sleeping pad in place. There are definite benefits to these models, especially for campers who insist on bringing a sleeping pad. They add weight, however, so you need to determine if the quality of comfort is worth the additional ounces. Finally, underquilts can be hung beneath your hammock, serving as a protective layer from the elements without necessitating the addition of a pad. They can run on the expensive side, but if you spend multiple nights in your hammock in a row, it may be a piece of gear that is worth the investment. There are two primary hammock accessories that are recommended for anything beyond an overnight expedition. An integrated mosquito net is essential in buggy locations, such as beaches, lowlands, and campsites near water. These are usually lightweight and inexpensive, so it’s better to bring one along rather than be without. After all, a night of getting eaten alive by mosquitos tends to ruin even the best camping trip. As with a tent, a rainfly is also an essential add-on as you never know when an unexpected rain shower might appear. The best rainflys cover the entire hammock from end-to-end with added room on the side in order to prevent rain from making its way to the interior. Most hammocks don’t come with tree straps but they are essential for hanging purposes. Select straps that protect the tree — we recommend those with a minimum width of 0.75 inches, a flat design, and either nylon or polyester construction. An alternate type of suspension system involves the use of whoopie slings, which have the advantage of being more adjustable. This system utilizes a basic loop and knot system that can be tightened to hold a hammock in place. Bottom line: Straps make for easier setup but whoopie slings are more adjustable under tension.